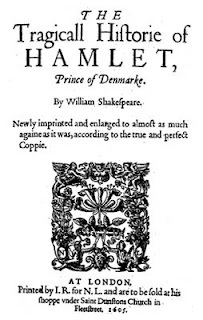 Welcome to Hyperion to a Satyr, a new project of mine that consists of examining in altogether too much detail my favorite play of all time, Hamlet Prince of Denmark by one William Shakespeare, and its varied dramatic representations, with an eye towards staging, performance and text. This blog will look at Hamlet, scene by scene (or scene fragment, some scenes are just too long for single posts). First, we'll talk about the text itself, what staging and performance problems it poses, what ambiguities have been laid into it by, and so on. Then, the scene will be discussed through the filter of filmed versions of the play. How did each filmmaker or actor address the play's problems and ambiguities? What effect do their choices and cuts have on our understanding of the characters and their world? Now, if you search for Hamlet on IMDB, you'll find more than 70 iterations, and that's just for "exact title matches". I will not be using them all for this project. In my next post, I'll detail which Hamlets have actually made the cut (short answer: still plenty). And in addition to movies, you can also expect Hamlet in other media, like comics, music and games. Whether you're a Shakespeare fan or a movie fan, I hope you'll enjoy your visits here. I'm particularly interested in how this classic work can be given so many interpretations, and how each interpretation can shed new and different light on the Bard's masterwork. Literary critics have said that Hamlet is the deepest well ever created in literature, that you can never get to the bottom of it, never draw a "single" answer from it. I think this little exercise will show that statement to be true!